18" x 20" x 7"
17.5" x 17.5" x 17.5"
Intaglio Print 37" x 25"
Greetings and welcome to the March edition of Holsten Galleries News. I have some exciting new work by several artists to share with you this month. I am also adding a monthly feature which will be an interview with either a glass artist or a collector. For this month I have chosen to feature Nancy Callan. 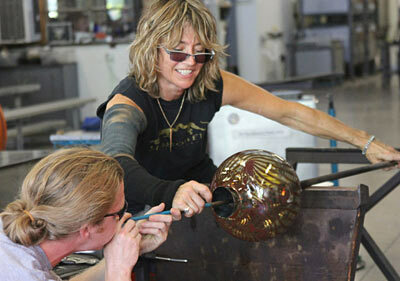 Kenn Holsten: How did you get started in blowing glass? Nancy Callan: I was a self -taught graphic designer straight out of high school. At age 28 I decided to go to Massachusetts College of Art. After a short time there, I changed my major from graphic design to ceramics and sculpture. One day I wandered into the hot shop and it was love at first gather. 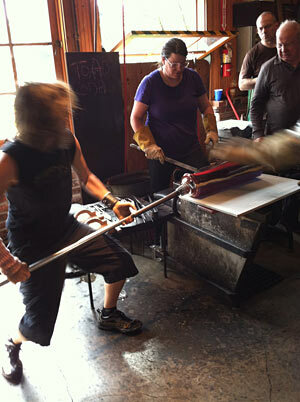 I became totally enamored of the material and switched my major to glass at age 30. K: What is your favorite series that you are currently working on? N: I like to work on several series at a time and love them all for different reasons. The Clouds are challenging because it is a difficult shape and I want it to look light and effortless. I also enjoy the Top series — it is playful and I can continue making pieces in that series with all of my different techniques. K: In addition to making your own wonderful pieces, you have been a key member of Lino Tagliapietra’s team for 18 years. What is the most important thing you have learned by working with the Maestro? N: I have to name several: A work ethic, innovation and pushing the limits of glass. K: What is the one secret ingredient without which you could not create the work you are making? N: I would say they are two and they go hand in hand: passion and playfulness. K: What is your most memorable trip? N: A few years ago I traveled with Lino to Brazil and we blew glass in Mario Seguso’s factory there. That factory was 30 years old and I was the first woman to ever blow glass there! K: If you could go back in time what artist would you like to hang out with? N: I would say Alexander Calder. I love his playful sensitivity, particularly in his famous "Calder’s Circus." K: What are your long-term career goals? I have recently added 8 new works to my Lino page. The one here is from his "Kookaburra" series and I think it is one of the most beautiful Lino pieces I have seen. The extraordinary use of large, colorful murini in a form which is simple but super elegant makes for an irresistible combination. To me this is a very joyful work of art! And, just in case you are wondering, a Kookaburra is an exotic bird which inhabits Australia and New Guinea. This wonderful piece from Martin Blank’s "Lotus" series is a great example of an organic form inspired by nature in which the coloration is pushed to the extreme. I love the flowing lines and gradation in color in every petal. It’s wonderful when art meets nature in such a graceful way! Most of you who are familiar with Veruska Vagen’s work are used to seeing portraits of characters immortalized in famous works of art, rendered by Veruska in tiny dots of colored glass. Here is an example of this series and please visit her web page to see more. Recently, in addition to human figures, Veruska has been “drawing” pets from well known paintings. Veruska is also open to commissions of your favorite pet, even if it is not in a famous painting! Dale Chihuly is not only a three-dimensional artist. More and more collectors are discovering Dale’s two-dimensional art. Whether it is Chihuly’s unique drawings on paper with acrylic or his limited edtion prints, we see the same expressive, colorful and energetic esthetic on his wall art as on the more familiar pedestal and table top glass sculpture. "Blues Duet" is an intaglio, drawn on a sheet of copper, inked and printed in very subtle colors and then overpainted with bright colors of acrylic. I hope you have enjoyed this issue of Holsten Galleries News. To view past issues please visit this page. I look forward to staying in touch.